You are here: Home > Harmony at Home, Phase 3: 18 of 18 Sessions: Estate Disaster Relief Year 2014 Over! Harmony at Home, Phase 3: 18 of 18 Sessions: Estate Disaster Relief Year 2014 Over! It feels so good to say we’ve reached the end of the “Estate Disaster Relief Year 2014.” Phase 3, 18 of 18 sessions was completed on December 23, 2014. The estate management process has humbled me. A mountain way bigger than myself, it took a small team (myself, my beloved Karl, Edith, Hillary, and Melissa) to tackle, in one year, just 1/3 of it… the easiest 1/3. A punishing schedule I put upon myself this past year 2014, I do now feel a sense of justification and personal benefit for driving myself to a present state of better home and office functionality. We are living with greater peace-at-home. Now, I hope to experience something like the lotus emerging from the mud (notice the lotus flower image on the plate hanging above the blue chair in the photo)! Tackling a goal takes energy and focus and motivation, three things that are in limited supply in any person, no matter how driven. Taking on many goals at once spreads out your available energy and focus and motivation, so that you often run out of steam after the initial couple weeks of enthusiasm. Then the goals sit there on your list, gathering dust, while you feel guilty about not achieving any of them. Milestone (July 31, 2014): Marymac Missions’ Business Filing System Created! Milestone (November 25, 2014): Estate Easy Done, Yoga Room Reclaimed! 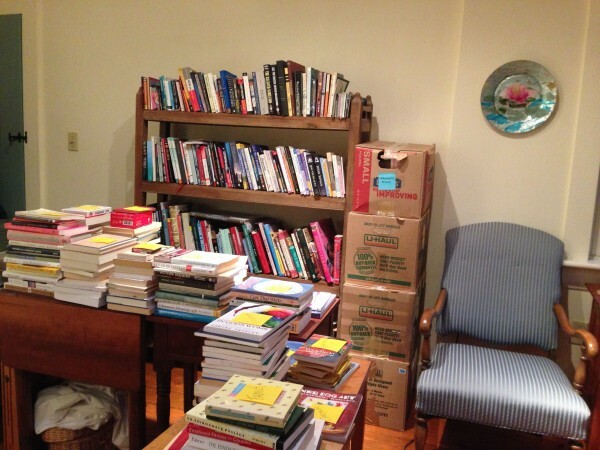 Milestone (December 18, 2014): Mary and Karl’s Personal Filing System Created!